The School of Art at MSU and the Waller-Yoblonsky Gallery are pleased to present Same, Same, Different, a mixed media cultural exchange project between school children in Dembayara, Guinea, West Africa and Bozeman, Montana. By placing two bodies of work together the children participate in cultural exchange and their artwork fills the space between them. A space that is usually filled with fear, discrimination, and economic disparity. The artist, Sarah Budeski, will be presenting the project she oversaw on location in Dembayara and Bozeman at the gallery, April 9th-13th. The closing reception will take place April 13th from 5:30-7:30. Same, Same, Different is a three part show. It foremost includes the children’s project, “Authentic Me” a mixed media installation of relief prints and photography. She will also be showing “Expectation / Realization”, a body of work created by the artist, Sarah Budeski, inspired by her own experience crossing cultural and geographical borders. Lastly, she will present “The Vehicle” a inside look at the budding nonprofit organization that made the project possible. Two groups of children participated in the project “Authentic Me.” One group from Dembayara a rural village in the high desert region of Guinea in West Africa, and the second from Bozeman, Montana, a mountain town in the Northwest United States – two vastly different places both geographically and culturally, yet both rich in their own unique ways. All of the materials used to make the relief prints were locally sourced. Sarah used these local resources as a way to talk about person and place, and how our homes influence our authentic self. Engaging with subjects as artists allows them to claim their own image. This project works to give ownership of cultural and personal identity back to the subject and to break conventional ideas of portraiture. Children were empowered to show their authentic existence and innate right to human dignity by making relief prints (non-representational self-portraits) and documenting their lives through simple photography. By placing this conversation in the hands of children, Sarah received a honest representation of the participants reality through their own eyes. Sarah desired to remove the bias that often plagues the photography of different cultures by foreign artists. This bias often manifests as a removed viewpoint instead of an authentic local perspective. When we remove this bias we are more accurately able to understand and empathize with each other. This project is about separation, it is about privilege, poverty, power and race – but it is also about love, family, and connectedness. A paradox that ultimately explains many corruptions of the world: misunderstanding of that which is different. Budeski says these differences can help us to come together, or divide us. It is our choice. Proceeds from the artists work will go to the nonprofit Guinea Exchange in full. About the Artist: Sarah Budeski is a second year Studio Art major at Montana State University. She enjoys both drawing and printmaking as her primary medium. Sarah has had a passion for West African culture ever since she started drumming in Bozeman with West African drum teacher, Chet Leach, at the age of seven. Sarah recently travelled to Guinea with project assistant, Kendall Levinson, to partake in drum and dance classes, continue work with Guinea Exchange, and complete the project Same, Same, Different. Sarah hopes to continue working on projects like this and sharing the authentic and beautiful identities of people across cultures and how we can affect and help each other in positive ways. For more information contact Sarah Budeski, sarahbudeski@gmail.com, 406-600-5711. The Helen E. Copeland Gallery and the School of Art at Montana State University are pleased to announce the Master of Fine Art’s thesis exhibition of Ryan Keith Parker, Coping with the Landscape. The exhibition will take place at the Helen E. Copeland Gallery in Haynes Hall on the Montana State University campus in Bozeman, Montana, April 9th- April 13th, 2018 from 9:00 am- 5:00 pm. Parkers’ thesis defense will take place April 9th at 11 am – 12pm in the gallery. There will be a reception for Coping with the Landscape on Thursday April 12th 2018, from 6:00 – 8:00 pm. All events are open to the public. Coping with the Landscape refers to Parker’s fear of the state of the contemporary landscape– fear generated by the loss of humanity in the land that supports the movement of capital first, and the needs of the locality second. To cope, this series of photographs follows the intermediate zone, which crosses the borders of infrastructure space and domestic space, searching for a path through the land which is not prescribed. Illuminated by billboards and street lights, a plague of winter snow captures the turbulence felt by the occupants of the land, struggling to cope with the instability of this human-made landscape. Parker received his BFA at University of Wyoming at Laramie in 2014 and has exhibited regionally and nationally during the last decade. Recently, he was invited to work collaboratively with photographer’s artists across the country in Overshadowed, a slow-motion time-lapse project recording the 2017 solar eclipse. Along with exhibitions, his work has been published in multiple magazines including an upcoming selection by Subjectively Objective and Float Photo Magazine for a joint venture entitled The Vernacular of Landscape. The Helen E. Copeland Gallery is located on the second floor of Haynes Hall, across from the Aasheim Gate off of 11th, with the Ski Swing out front. Please note that the parking passes are required for parking during the business day (6AM – 6PM). Gallery Hours: Monday – Friday, 9AM – 5PM/Closed on weekends. 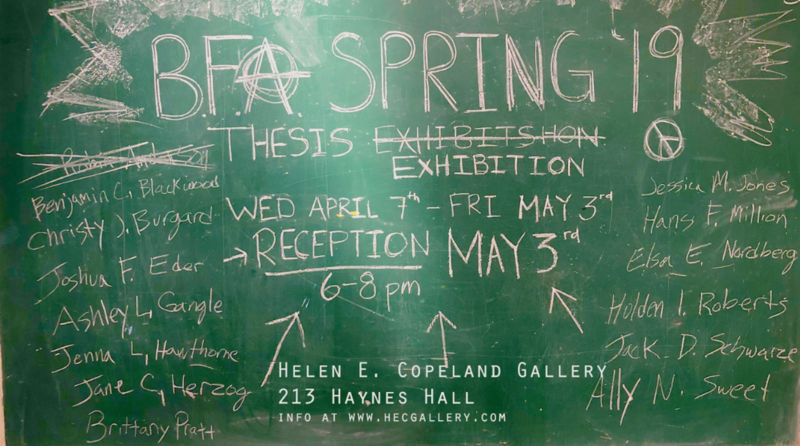 For more information on this exhibition or on the Helen E. Copeland gallery in general, please visit http://www.hecgallery.com or follow us on Instagram under helen.e.copeland . The Helen E. Copeland Gallery and the School of Art at Montana State University are pleased to announce the Master of Fine Art’s thesis exhibition of Rachael Marne Jones, Deep Now & The Seed Bank Project. The exhibition will take place at the Helen E. Copeland Gallery in Haynes Hall on the Montana State University campus in Bozeman, Montana, April 2nd– April 6th, 2018 from 9:00 am- 5:00 pm. Jones’ thesis defense will take place April 2nd at 11 am – 12pm in the gallery. There will be a reception for Deep Now & The Seed Bank Project on Thursday, April 5th 2018, from 6:00 – 8:00 pm. All events are open to the public. Deep Now & The Seed Bank Project will be comprised of sculptural works & drawings that challenge preconceptions engrained in modern society’s construction of linear time. The industrial revolution has caused a massive shift in the way in which humans relate to each other, the environment, and everyday objects. Deep Now uses man-made forms in conjunction with geologic processes to emphasize the correlation between the simultaneous expanse and collapse of our understanding of time as dispensable and infinite. Reflecting upon on the previous five extinctions on earth, the works are inspired by using geologic evidence to help predict our evolutionary path and encourage a more interconnected outlook on how to move forward for future generations. Grasping to understand the current ecological, political, and economic climate of our time, The Seed Bank Project focuses on the collaboration of cultures across the world to reliquarize seeds that have significant ecological and cultural value within the places they call home. Burying the seeds in porcelain seed banks specially designed to keep them viable for as long as their DNA will allow, The Seed Bank Project celebrates our global and technological advances, while instigating a dialogue of ecological stewardship among future generations. Rachael Marne received her BFA at University of Montana in Missoula in 2011 and is the founder of the Seed Bank Project, and has exhibited regionally and nationally. Currently, she has work at the 2018 NCECA conference in Pittsburg in the Intercultural Exhibition. She has also been accepted as the first artist Fellow in the Global Sustainability Fellows Program which will take place at the Arava Institute for Ecological studies in Israel this summer. Following Deep Now & The Seed Bank Project will be Ryan Parker, who will be presenting his thesis exhibition, Coping with the Landscape from Monday, April 9th – Friday, April 13th, 2018. For more information on this exhibition or on the Helen E. Copeland gallery in general, please us on Facebook at facebook.com/msuhecg and Instagram under helen.e.copeland . The Helen E. Copeland Gallery is pleased to announce Right Here / Over There, a thesis exhibition by MFA candidate, Kelsie Rudolph, from Monday, March 26th – Friday, March 29th , 2018. Rudolph’s verbal defense will take place Tuesday, March 27th at 11:00 am in the Helen E. Copeland Gallery and is open to the public. The closing reception will be held Thursday, March 29th from 6:00 – 8:00 pm and is free and open to the public. Light refreshments will be served. Rudolph’s objects in Right Here / Over There allude to architectural spaces such as walls, stairs and pathways, yet are abstracted and non-utilitarian. Though referential in scale and form, Rudolph’s use of mundane everyday materials such as soft faux furs, crocheted yarn, and latex paint employ the viewer’s physical senses. However, these materials are applied in unconventional relationships, giving the viewer the opportunity to create their own narrative. A dialogue unravels between the objects: from material swatches on the wall to the materials themselves used within the objects. A vernacular of form further propels this conversation throughout the gallery space, turning these uncanny objects familiar once again. Meaning is derived through the emotionally loaded act of feeling. Our senses are a universal aspect to the human condition, creating a commonality across cultures. Right Here / Over There invites the viewer to actively engage these senses, accessing their own personal memories through simple material comparisons. Kelsie Rudolph is a Montana based artist working primarily in ceramic sculpture. She received her BFA from the University of Wisconsin-Stevens Point in 2013. Her work stems from a utilitarian perspective, heavily influenced from her time working as an apprentice to wood-fire potter Simon Levin. She worked collaboratively building two wood-fire kilns with Levin in Hangzhou, China in 2014, followed by a short residency there to teach the students firing techniques. A four-month residency at Tainan National University of the Arts in Tainan, Taiwan in 2016 gave Rudolph the time and space to explore large scale sculpture, as well as cultural complexities. An invitation to show at the International School of Art in Havana, Cuba in 2017 further propelled this interest in the overlap between cultural and sensorial human commonalities. Workshops at the Archie Bray Foundation in Helena, Montana; the Anderson Ranch in Snowmass Village, Colorado; as well as her everyday life in Bozeman, Montana, give her time to reflect on her own culture in relation to the others she has experienced, heavily influencing her interest in where humans all fundamentally overlap, from the engagement of our senses to the narratives we develop around place and objects. For more information on her recent works visitwww.kelsierudolph.com. Finally, Right Here/ Over There is the first of the three MFA candidates, Rachael Marne Jones who will be presenting her thesis exhibition, The Deep Now in conjunction with The Seed Bank Project from Monday, April 2nd – Friday, April 6th, 2018. Clashing solid forms with slinking fabrics, Nicholas Kovatch and Kelly O’Brien explore Spatial Dichotomy. With their unique three-dimensional practices, which explore specifics of material associations, visual contrast takes over the viewer’s perception. The dichotomy between their practices is stimulating; one utilizes materials that are considered construction grade, while the other employs soft, glitzy and artificial textiles. Kovatch and O’Brien create an immersive installation that brings attention to contemporary consumerism through the duality of art practices. Through placement of our works, we will prompt viewers to slow down and contextualize their surroundings through colorful materials and minimalist objects. This juxtaposition merges some of O’Brien’s site sensitive installations against Kovatch’s hyper-aware formalism. Kelly O’Brien and Nicholas Kovatch have been active artists in the Twin Cities area for the past five years. Kovatch, an alumnus of Montana State University-Bozeman, saw the call for exhibitions at the Waller-Yoblonsky Gallery and thought it was a great opportunity to return to his alma-mater with another extraordinary sculpture and friend, O’Brien. Kelly O’Brien is a tenure-track Assistant Professor of Contemporary Sculptural Practices at the University of Wisconsin-Stout, WI, and is an MFA Mentor at Minneapolis College of Art and Design (MCAD) in MN. O’Brien has her MFA in Sculpture from Georgia State University in Atlanta, GA and BFA in sculpture and painting and BA in philosophy from Buffalo State College, NY. Recent accomplishments include a 2015 McKnight Visual Artist Fellowship, nomination for a Joan Mitchell award, and a solo show review in ARTFORUM.com, and has been featured in New American Paintings, Midwest. Solo shows include SooVAC in Minneapolis, Kibbee Gallery in Atlanta, and an upcoming show at The Phipps Center for the Arts in Hudson. Commissions include an educational installation for The Alliance Theater at the Woodruff Art Center, Atlanta, and a stage Installation for TEDxTalk, at TEDxPeachtree. Nicholas Kovatch is an active sculptor, installation artist, and Adjunct Professor based in Minneapolis, Minnesota. He received his Bachelor of Fine Arts from Montana State University-Bozeman’s School of Art. Recent accomplishments are a National Endowment for the Arts Fellow at the MacDowell Colony in 2014 and was a fellow at the Arteles Creative Center in 2016. Kovatch received his MFA in Visual Studies from the Minneapolis College of Art and Design and his work is currently exhibited at the Bemidji Sculpture Park in Bemidji, MN. The Waller-Yoblonsky Gallery is located on the west side of 19th Ave. Head west on Garﬁeld and take a left at the blue MSU School of Agriculture sign. Continue on the dirt road until you reach an intersection with another sign indicating the Melvin Graduate Art Studios located to the right. After turning right, pass the equestrian and Farrier building until you read the Melvin Graduate Art Studios. Please drive under 15 mph once you leave Garﬁeld St.
Waller-Yoblonsky Hours: Monday – Friday, 9AM – 5PM / Closed on Weekends. To schedule and appointment to see the exhibit, please email Ella Watson or the Gallery Managers, Victoria Burchill at victorialburchill@gmail.com or Alyssa Willard at alyssa_@q.com or visit http://www.hecgallery.com. The Waller-Yoblonsky Gallery is pleased to announce a very personal photographic show more than 14 years in the making. Artist Angela J. Yonke will be showing her ongoing series called Mama: Healing Portraits featuring photographic, mixed media and video work April 2nd-6th. A closing reception will be held Friday, April 6th 5:30-7:30pm. Through these images Yonke explores a complex relationship with her mother and family members, and the subsequent impact made by the illness and death of her mother on her work and life. Many images on display were taken during her mother’s struggle with cancer spanning 2001-2003. Until recently these photographs had not been printed, shown or shared by the artist, unable to contemplate the series and give it light. Since printing these negatives Yonke has also produced a body of mixed media works combining photographs, painting, sewing and paper along with written pieces which serve to document her continuing story. Hand-made is a continuing technique and theme in Yonke’s work and connections between this skill taught to her by her mother are very present and connect the past and present. These words and pictures have served to give Yonke some healing and closure. This work is incredibly vulnerable. It recognizes a great sense of loss and an emotional toll but also delves into the process of healing and is a celebration of life. The artist does not mean to shock or distress the audience with her images, merely put forth raw beauty and strength and tell her story. Art is about vulnerability and this is hers. Proceeds from any sales of these works will be donated to the American Cancer Society. Angela J. Yonke is a photographer, art teacher and artist currently living mostly in Bozeman, MT. She has degrees in Art Education, Photography and Environmental Studies from Western Michigan University. She has taught Art and Photography since 2004 at public, private and non-proﬁt organizations in Michigan, Chicago and Bozeman. Themes in her multi-media work deal with hands, gesture, humor, non-verbal communication and human relationships. The Helen E. Copeland Gallery (HECG) and the School of Art at Montana State University are pleased to announce the exhibition, Jessie Wilber: A Pioneer of Modernism in Montana at the HEC Gallery, located on the second floor of the School of Art in Haynes Hall, Bozeman, MT. The show will be on exhibit Monday, March 5th through Thursday, March 22nd, 2018. A Closing Reception and Lecture will be Thursday, March 22nd 2018 from 7:00-9:00 p.m. Starting at 6:00 p.m. there will be a short lecture in Cheever Hall 215 (adjacent to Haynes Hall) by Guest Curator Michele Corriel. The reception will follow in the Helen E. Copeland Gallery. This free event is open to the public. Hors d’oeuvres will be served. Jessie Wilber: A Pioneer of Modernism in Montana showcases many of Wilber’s woodblock reliefs and woodblock matrices. Funding to frame the collection of prints by Wilber, which are housed in the School of Art Archives, was provided by the Center for Western Lands and Peoples. Part of the 125th Birthday Celebration of MSU, this exhibition features the enduring art of one of the School of Art’s most legendary artists. Born in 1912, Jessie Wilber has received praise and recognition for her contribution to introducing Modernism to the state of Montana along with contemporaries such as Robert and Gennie DeWeese, Peter Voulkos, Rudy and Lela Autio, George Conkey, and Frances Senska. Her contemporary approach of the time has lead her to be known best for her printmaking skills and subject matter which ranged from documentation of teepee patterns with Olga Ross Hannon, or her interpretation of musicians after her trip to Africa with Senska. Within this exhibition, subject matter that has been pictured is from her home life here in Bozeman, depicting owls, cats, huns, and horses. Wilber came to Montana State College in Bozeman after receiving her A.B. and M.A. at Colorado State Teaching College. She remained at Montana State as an art faculty from 1941 to 1972. Her artistry unfolded in Montana, working along her fellow peers like the DeWeese’s and Frances Senska as one of the earliest founders and teachers of the Archie Bray Foundation in Helena, MT. By the 1950’s she became Director of the School of Art at Montana State University. The legacy that Wilber left behind transcends her art and teachings, but her very impact on the community of Bozeman. It is easy to find old friends and MSU students who tell stories of her graciousness, as well as a professor who cared profoundly for her students. Jessie Wilber left her mark on Montana as an artist who wanted to redefine, and allow for a modern interpretation of the western landscape, beyond the traditional representation of mountains and horses, but illustrating the world around her in the new and exciting aesthetic of the time. Being exhibited concurrently with Jessie Wilber for the month of March, is a retrospective of the work of Robert and Gennie DeWeese in the Dean’s Gallery on the second floor of Cheever Hall, adjacent to Haynes Hall. Finally, following Jessie Wilber: A Pioneer of Modernism in Montana is first of the three MFA candidates, Kelsie Rudolph who will be presenting her thesis exhibition Right Here, Over There from Monday, March 26th – Friday. March 30th, 2018. Jessie Wilber will be on view from Monday, March 5th – Thursday, March 22nd, 2018 in the Helen E. Copeland Gallery. The HECG is located on the second floor of Haynes Hall, across from the Aasheim Gate off of 11th, with the Ski Swing out front. Please note that the parking passes are required for parking during the business day (6AM – 6PM). Gallery Hours: Monday – Friday, 9AM – 5PM/Closed on weekends. For more information on this exhibition, Jessie Wilber: A Pioneer of Modernism in Montana, or on the Helen E. Copeland gallery in general, please visit www.hecgallery.com or follow us on Facebook at facebook.com/msuhecg.